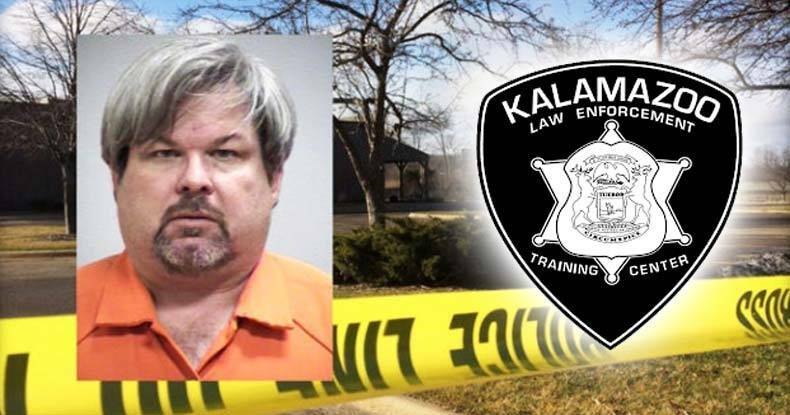 Media accounts of the Kalamazoo murder rampage have focused heavily on the fact that suspect Jason Brian Dalton was employed as an Uber driver. Scant attention has been paid to the fact that Dalton had aspired to become a law enforcement officer. According to CNN, Dalton earned an associate’s degree in law enforcement from Kalamazoo Valley Community College in 1992. The reader is invited to believe that Uber failed to perform due diligence in vetting Dalton. His unremarkable history of traffic violations, however, would not have disqualified him to attend the police academy: While traffic violations would have been reviewed as part of an assessment of his “moral character,” Dalton had no felony convictions or comparable offenses in his record. The KVCC Police Academy boasts that ninety-two percent of its alumni “work in law enforcement — the highest in the state….” As an academy graduate, Dalton could have obtained a peace officer certification, and then be deployed on the streets in uniform, carrying a gun, invested with lethal discretion and “qualified immunity” in the exercise of deadly force. Rather than being an Uber driver, “Officer Dalton” would have been behind the wheel of a patrol car, and since he would possess state-granted powers of arrest, he would have been able to detain victims on his own initiative, rather than waiting for them to come to him. Uber is an upstart independent service challenging well-entrenched local monopolies. This made it an inviting target for opportunistic criticism of its vetting procedures. Like any other market-based entity, Uber will refine and improve its performance. The same cannot be said, however, of the government’s law enforcement monopoly. A Louisiana resident, for example, can become a government-employed police officer without any training or certification whatsoever, and continue in that occupation on a part-time basis without ever attending a police academy. Owing to a lack of oversight, Louisiana motorists face the possibility of running into an “Officer Dalton”-style sociopath whose “qualifications” are a government-issued costume and corresponding jewelry – and the intangible “qualified immunity” that sets him apart from unprivileged predators in the private realm. A similar state of affairs exists in Arkansas. In order to become a licensed practicing cosmetologist, the Arkansas Department of Health requires an applicant to pass a state board examination and complete 2,000 hours of specialized training. After logging 600 hours, an applicant can qualify to work as a manicurist or instructor. The same state government that exercises such rigorous oversight of people who cut hair or paint nails in the private sector imposes no training or licensing standards on police officers. “The second night I ever put on a badge and gun I was riding in my own car,” recalled Crittenden County Chief Deputy Tommy Martin. At the time, Martin was 21 years old and hadn’t spent so much as a minute inside a police academy classroom. “According to Arkansas state law, officers do not have to be certified for up to a year after they’re hired,” reported the Memphis Fox News affiliate in February 2010. The lax standards governing “professional” police officers in Arkansas allowed Coleman Brackney, a man convicted of criminal homicide, to become Police Chief in Sulphur Springs. In January 2010, Coleman Brackney, at the time an officer in the department that menaces nearby Bella Vista, murdered a man named James Ahern following a high-speed chase. After trapping Ahern’s vehicle and then pounding on his window, Brackney shot him six times – the last time in the back. Brackney claimed that Ahern – who had a record of trivial and petty offenses – attempted to run him over after the chase had ended. This was a lie, of course: The dashcam video documented that Brackney was never in danger. After Brackney was released, his criminal record was expunged. In April 2013 the Arkansas Commission on Law Enforcement – a regulatory body that enforces less rigorous professional standards than whatever body sanctions professional wrestling referees – reinstated Brackney’s “peace officer” certification. All that he needed now was a job opening – and one was soon created in Sulphur Springs. The same media disinformation complex that treats Uber as a public menace over the six lethal shots fired by cop wanna-be Jason Brian Dalton had no interest in the six lethal shots fired by Officer Coleman Brackney – or the corrupt government monopoly that renewed Brackney’s license to kill.